I've read and heard "British English", "American English", "Australian English", etc. I know there are differences in accents and word choices but is there a larger difference that makes nationally-named Englishes any different than regionally-named Englishes? For example, I grew up in Pittsburgh, PA, USA and that area speaks Pittsburgh English. Is that still considered American English, or is it a dialect within American English? Is there a family tree of sorts to show how/where all the different Englishes arose from? Dialects are linguistic varieties which differ in pronunciation, vocabulary and grammar from each other and from Standard English (which is itself a dialect). 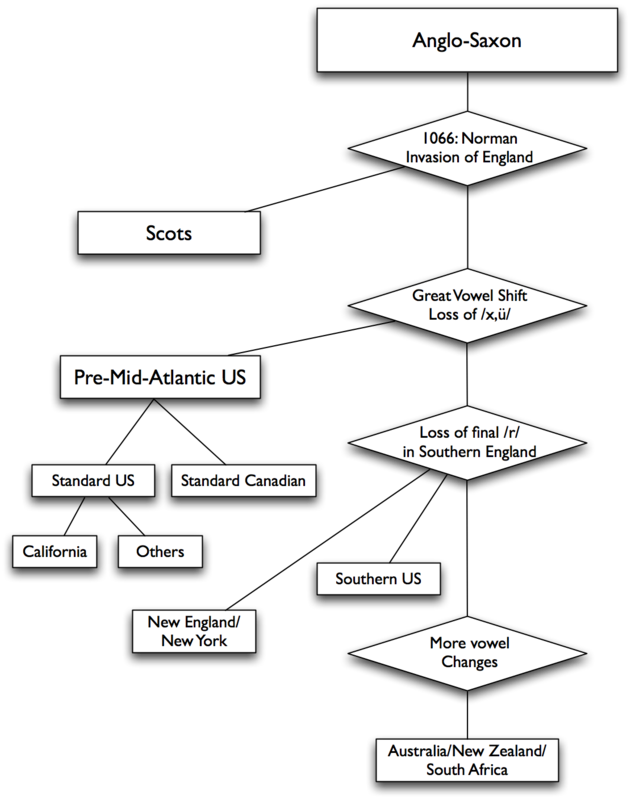 I actually did find a simplified tree of English dialects, and it shows the changes that occurred between one and the next. There's also a dialect map for the US, which shows which regions share an overall dialect. Many of the Northern dialects can trace their roots to this dialect which was spread westward by the New England settlers as they migrated west. It carries a high prestige due to Boston's early economic and cultural importance and the presence of Harvard University. A famous speaker is Katherine Hepburn. They sometimes call doughnuts cymbals, simballs, and boil cakes. However, the dialects shown are only dialects of American English. Pittsburgh English, the dialect you originally asked about, is listed as a North American regional dialect of English. As any language develops, it changes. If one language is spoken in an area that is geographically removed from the rest of the language speakers, changes will result in the two languages drifting apart from each other. All living languages changes over time. The changes can range over all the aspects of language, such as phonology (leading to the languages sounding different) or lexical (where the newly introduced words or changes in word meaning can make the language somewhat incomprehensible). The more the language changes from a "parent" language, the more likely the language will be eventually deemed a "new/separate language". The distinction of which is often blurry (like Dutch being linguistically difficult to differentiate from being "just a German dialect"), and leads to the common adage: "A language is a dialect with a border and a military." These sentiments of language identity are usually tied with a cultural/national identity and is a motivating factor in the declaration of a "new language." It is plausible that some of these different Englishes could become their own languages in time, and the sooner that comes about the more likely it will be a nearly mutually comprehensible language with American/British English. Off the top of my head, I could see Indian English (South Asian English?) branching off more quickly than many of the others, due to such a large amount of languages influencing the speakers in that region, and because it is already a very phonologically and lexically different form than American/British English. And as a quick aside, I think these changes will be less common, or at least not as fast as they might have historically happened, due to the global society that is emerging from technology (i.e. the internet and mass broadcasting of media). How exactly you distinguish one "dialect" or speech variety from another is really a bit arbitrary. At the extreme end, you might even say that every individual speaker speaks a different dialect (you wouldn't usually, but my point is there are no well-defined places to draw the line). It's really a question of analysis and where you decide to make divisions for your purposes-- the divisions often being as much political as linguistic. 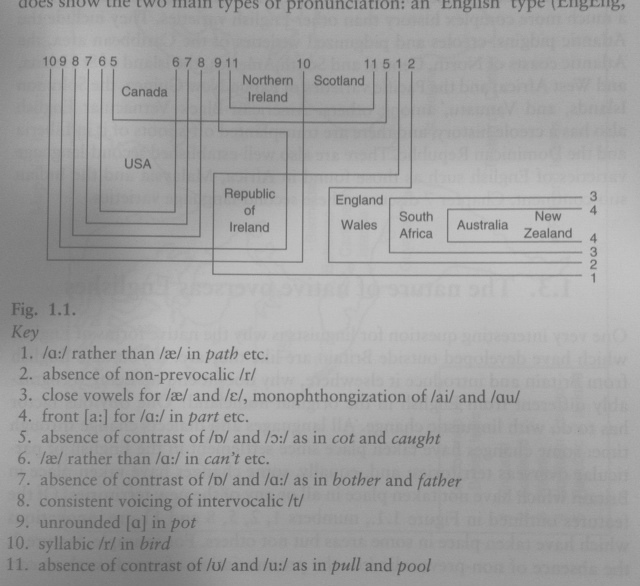 You may like to check out Trudgill & Hannah's, "International English", for an overview of what they see as the major distinguishing phonological features of major dialects of English. On the question of pronunciation, for example, they make the broad divisions as shown below. There is surely a whole hierarchy of subdialects within each of these major dialects, with variations on the broad features identified. But the point is that it gives you a broad overview and perhaps highlights some of the more salient features that we subconsciously use to identify different varieties of English (in this case, in relation to their sound system). Not the answer you're looking for? Browse other questions tagged differences dialects or ask your own question. Exactly what language do I (we) speak? What's the difference between “universality” and “pervasiveness”? What's the difference between colloquial and oral English? What's the difference between the two sentences? What's the difference between phonograph and gramophone? What's the difference between notorious and infamous? What's the difference between “Speakers of English” and “English speakers”? What is the difference between English besides English (UK) and English (US)? What's the difference between “important” and “matter”?